On the 17th of July, 1996, a Boeing 747 owned by TWA and bearing tail number N93119 was en route to Paris from JFK airport. The flight had departed New York's main international airport around 8:19 PM local time. About two minutes later—at precisely 2031:12—the cockpit voice recording abruptly ended. While TWA 800 was south of Long Island, and still in U.S. air space, the 747 sustained a catastrophic explosion and in-flight breakup. The front part of the plane, including the nose, was completely severed from the rest of the aircraft. The plane then fell into the water, near the Long Island hamlet of East Moriches, killing everyone on board (if they were not already deceased as a result of multiple disasters occuring as the plane exploded, then broke apart). The NTSB (National Transportation and Safety Board) began its investigation immediately after the disaster. Among other things, the agency's investigators retrieved as many parts of N93119 as possible. Those parts were reassembled while the investigation continued (as demonstrated in this photo, taken on 20 May 1997, which is included in the NTSB Report as Exhibit 29 located at page 120 of the online PDF). 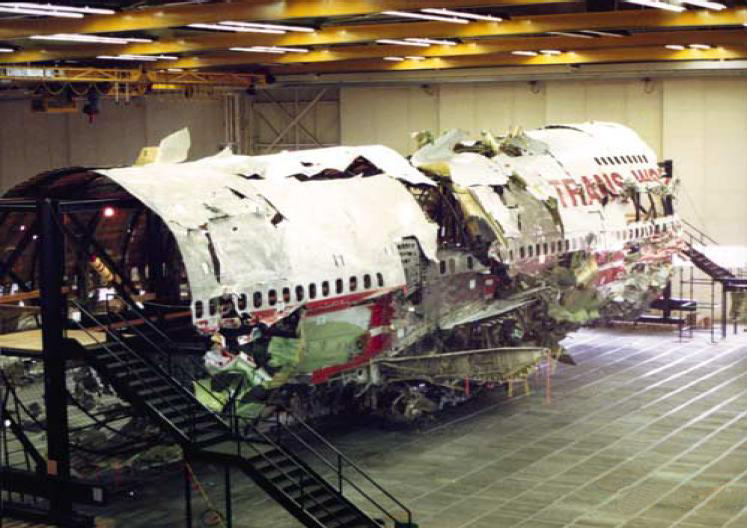 The National Transportation Safety Board determines that the probable cause of the TWA flight 800 accident was an explosion of the center wing fuel tank (CWT), resulting from ignition of the flammable fuel/air mixture in the tank. The source of ignition energy for the explosion could not be determined with certainty, but, of the sources evaluated by the investigation, the most likely was a short circuit outside of the CWT that allowed excessive voltage to enter it through electrical wiring associated with the fuel quantity indication system. Not everyone agrees with this probable cause. Among other theories is that the plane was struck by a surface-to-air (SAM) missile, fired by the U.S. military, which mistakenly hit the TWA flight. Many witnesses in the vicinity of the accident at the time that it occurred stated that they saw and/or heard explosions, accompanied by a large fireball over the ocean, and observed debris, some of which was burning, falling to the water. This map—Figure 21 from the NTSB report (located at page 82 of the online PDF version—visually depicts the location of the accident and shows where the split-apart plane entered the water. The NTSB color-coded the three separate parts of the broken plane—Figure 22b, at page 85 of the online PDF version—then matched those areas to the three separate debris fields—Figure 22c, at page 86 of the PDF—where divers found corresponding pieces of wreckage. In the image at the top of this page, we see the photo of a Navy diver scouring a debris field, on the ocean floor, after the non-survivable crash of TWA 800. Eighteen years later, to the day, another airplane was tragically lost in-flight. While controversy still exists about the loss of TWA 800—and whether it was shot down by a missle—there is no doubt at all about the act which doomed Flight MH17. It was shot out of the sky and every person, on board the flight, died. Image of Navy diver online, courtesy the U.S. Naval Institute website. Bos, Carole "Recovery Operation - Loss of TWA 800" AwesomeStories.com. Dec 08, 2016. Apr 21, 2019.